TL; DR: Format provides a platform for creative industry professionals to design and build beautiful websites to showcase and market their work. Artists can choose from a number of compelling themes that complement their aesthetic, which works to maintain brand integrity when customers view their work online. The platform fully integrates solutions, such as a client proofing portal and online storefronts, so customers are not directed away from branded sites to view or purchase products. This, coupled with full tech and marketing support services, makes Format an effective platform for creatives to exhibit and promote their artistic work. As a street photographer, Dotan Saguy has been around the world, snapping compelling shots from Cuba to Paris and Los Angeles. His most recent project gives viewers a glimpse into the interesting and unique culture of Venice Beach, which is known as Southern California’s hub of art, creativity, and quirkiness. Dotan’s black and white shots of beach culture appear to marry concepts of minimalism with action by weaving the geometric shapes of the landscape with human (and sometimes animal) activity. Contrast is created between a slinking boa constrictor hanging from a swing and the rigid lines of parallel palm trees in one photo. In another, a skateboarder looks to quickly slide across the coping circling an empty swimming pool. Format gives creative industry professionals a platform to showcase and market their work to the masses. Dotan’s photos deserve to be showcased in a way that complements his artistic style, and that’s just what the website building platform Format provides for him. Dotan’s photos are sleek, and so is his website. Format gives creative industry professionals a vehicle to design and build beautiful websites to house their portfolios. What makes Format unique, however, is the platform fully integrates solutions, such as a client proofing portal and online storefronts, that work to maintain brand integrity for customers interacting with their work. With a team ready to field questions and lend tech and marketing support, Format gives creatives the resources they need to broadcast their artistic pieces to the masses. A ton of effective site building platforms exist on the market, but in 2010 none seemed to be designed with the purpose of providing specific tools and templates to serve the creative community. Tyler along with Format’s Co-Founder and CEO Lukas Dryja noticed this void and acted. While studying design at OCAD University in Toronto, Lukas realized how few of his fellow students were sharing their work online. “I approached Tyler, who came from a software engineering background, and we decided there was a great opportunity to help creative professionals by developing tools to showcase their work on the web,” Lukas said. Lukas Dryja (left) and Tyler Rooney (right) co-founded Format based on a void in the creative community’s online space. Tyler was all ears, and rolled up his sleeves and got to work. Their efforts were successful right out of the gate. Creative-minded professionals with limited or no experience coding use Format’s platform to produce polished websites with an artistic slant. One of the reasons for Format’s success stems from how they listen to their users. Since the platform’s inception, those in the creative community have voiced their need to house all solutions — portfolio presentation, proofing, and marketing — under one roof to maintain brand integrity throughout all of their digital touchpoints. Format fulfilled this request by creating a turnkey platform that allows for the easy creation of compelling websites and removed the need to look to third-party vendors to provide venues for eCommerce and proofing. Format offers 16 themes creatives can employ to best showcase their portfolios, all of which are responsive and work across devices. 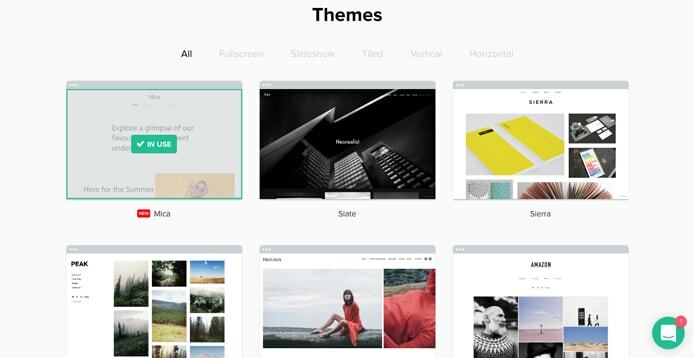 Format’s themes are unique in that they cater exclusively to the creative community. Format offers 16 themes creatives can employ to complement their aesthetic and showcase their work. Gary noted these considerations result in dynamic themes that fit to one’s body of creative work. Format focuses on giving creatives agency over how they construct their web presence. This is done by allowing users to organize sites in a number of different ways while maintaining a cohesive experience through a theme. Adding another layer of professionalism for end-users, Format developed an online proofing portal where clients can log in to view, approve, and rate a creative’s work. This removes the need to send huge ZIP files via email or send clients elsewhere to interact with their products. Many of the creatives using Format are independent contractors and freelancers who are cultivating their brands. The online proofing portal helps facilitate this by presenting a professional feel so clients know their photographer or artist is experienced and competent. One of the features that has the Format team and their users excited is the ability to host a completely integrated online storefront on their sites. Running an eCommerce site can be complex when dealing with payment processing, prominently displaying products, and properly managing transactions. Format recognized this and supplied a ready-to-go store offering to their users. This is a perfect example of what Format does best — give their users exactly what they want. In addition to photography and paintings, Format users are selling a host of other items and services in their stores, from makeup applications to jewelry and craftwork. One user is even selling a magic trick on his site. While the platform is incredibly intuitive, if users do run into technical issues or have questions about marketing and SEO, Format’s Success Team is available around the clock to help. Their goal is to ensure their user community is able to use Format to their best advantage. Format’s Success Team is available 24/7 to field questions on tech support, marketing, and just about anything else. In addition to the Success Team, Format also offers an online publication, Format Magazine, that covers a wide range of topics. The magazine features subjects of general interest to the creative community but also acts as a resource where people can learn about industry best practices and see how others in the Format community are utilizing tools to succeed. Format users also have access to long-form, downloadable PDFs that present creative-industry-specific advice on how to manage and market a business, social media strategies, and more. Dotan Saguy’s photography has taken him around the globe to shoot compelling subjects and tell stories about their cultures. Format has provided him with a quality online platform to share his work and, most importantly, do it justice by complementing his aesthetic. Format plans to continue serving clients like Dotan with new offerings. Marianne told us 2017 will begin with the launch of new themes with more to follow throughout the year. Format is also looking to expand. The platform is currently used by creative professionals in more than 190 countries, and the company hopes to broaden the reach of their online stores to more of them. This goal epitomizes Format’s aim to listen to what the creative community needs and supply it.